Welcome to The Hardys website and The Hardys book - with a News Page, a Photo Gallery, a "Google" site/book search and a forum - plus bagging info and prizes! The site stats show more and more interest, thanks for visiting (and re-visiting!). Do let me know what you think about the site and the Hardys (see the Contact page). Wherever you are in the United Kingdom, whatever your walking ability, there is a High Point you can visit. Everybody seems to be interested in the question “what is the highest point of … ?”. 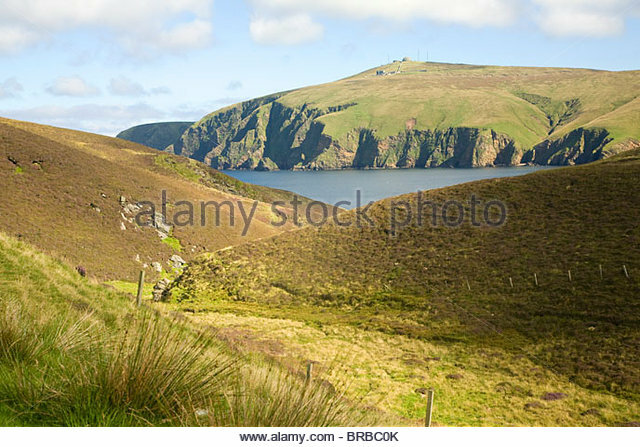 This site answers this question for the hill ranges, islands and administrative areas of the United Kingdom. It also provides the information people need to visit these High Points, encouraging everybody to go out walking, to improve their fitness, to enjoy the countryside, to explore the whole UK and to share their enjoyment. There is also a Facebook Group "The Hardys High Points". The Hardys are summarised in the Wikipedia article "Hardy (hill)", and included in the article "Lists of Hills in the British Isles". 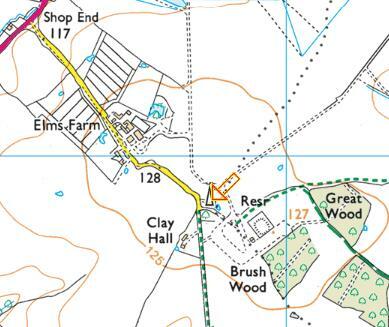 FEBRUARY 2019 - Wikipedia lists the Suffolk High Point ("County Top") as 136 metres at TL787558 (at the comms mast on the map); well, that's interesting - given there's no 130 metre contour on the OS Explorer map! The Hardys lists it at TL785561, in the area of the 128 metre spot height on the map, which looked about right on the ground when I bagged it years ago! ​MAY 2018 - two of my final seven core Hardys (leaving aside Sgurr Alasdair on SKYE for the moment! ), IONA and MULL - little and large! Dun I is a pleasant bump on IONA, looking down over St Columba's Abbey (after a 35-mile "single track with passing places" and a ferry); while Ben More is a mighty Munro, straight up from sea to summit - wonderful, climbed in good weather and taking only a very creditable (for us!) 2 hrs 10 mins. 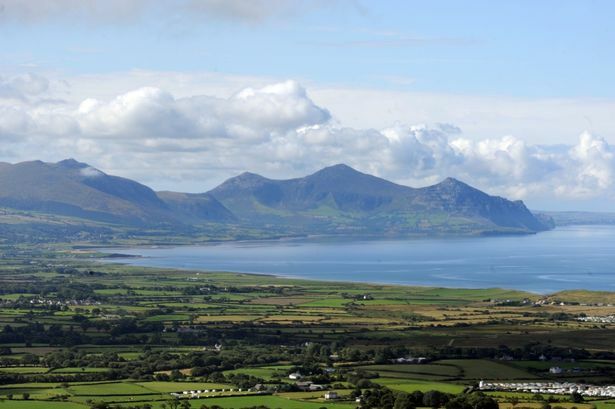 APRIL 2018 - walked around the Yr Eifl hills on the north side of the Lleyn Peninsula, an outlier of Snowdonia. Not huge mountains, but very pleasant coastal hill walking, and perhaps sufficiently "separate" to be considered for Hardy status? - at least as a "reserve"! NOVEMBER 2017 - the Saxa Vord area of UNST in the Shetlands is being touted as an "ideal location" for satellite launches in Britain! Well, it may be ideal from a "maximum payload to both sun-synchronous and polar orbits" viewpoint, and it may be ideal from the Highlands and Islands Enterprise and the local councils' angle, but any satellite launch facility development with associated "housing" there does not seem too ideal from a "remote wild scenery" point of view! The abandoned tracking and comms station on the summit of Saxa Vord is bad enough! JULY 2017 - THREE MORE CORE HARDYS VISITED! 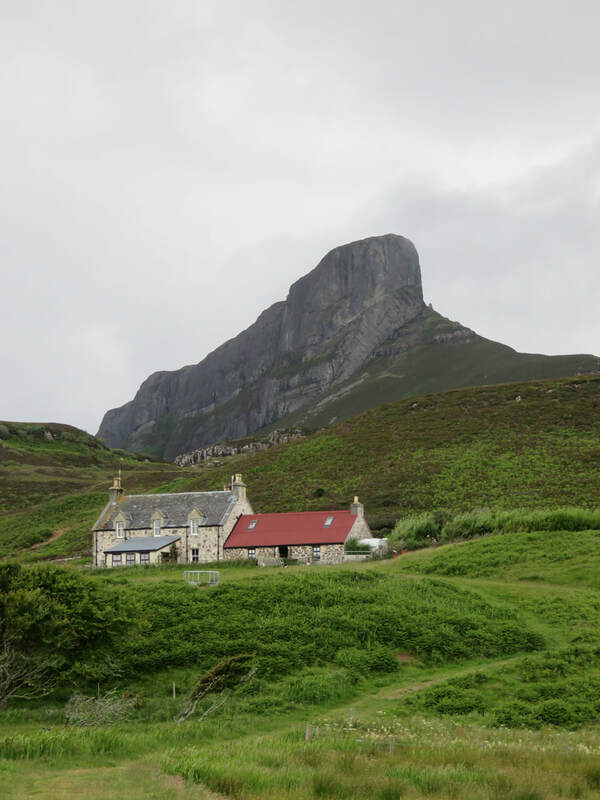 - I managed the Hardys on the school geography island trio of RUM, EIGG and MUCK during this summer's Scotland odyssey! 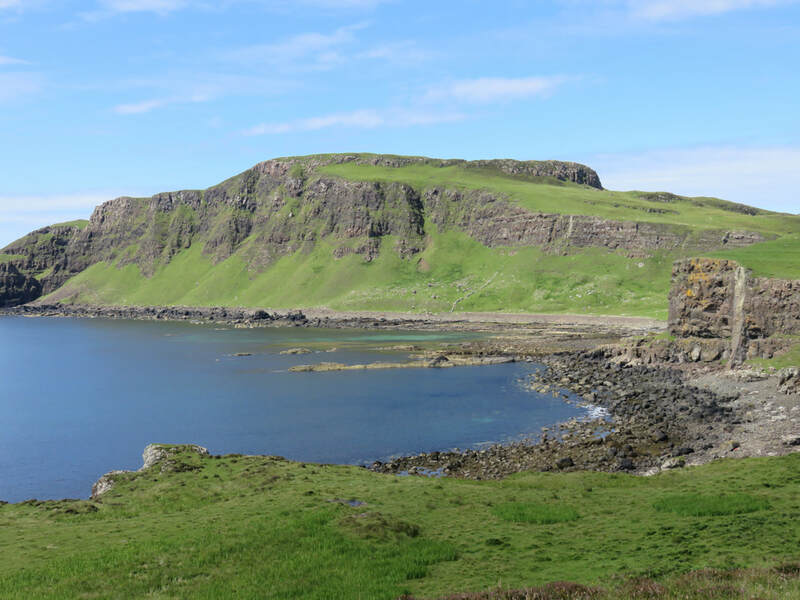 RUM and EIGG required overnighters because of the sparse passenger ferry timetable. Muck required some fast footwork between two ferries! Only seven to go now (given Sgurr Alasdair topping the Black Cuillin on Skye is sadly beyond my "FOFobia")! 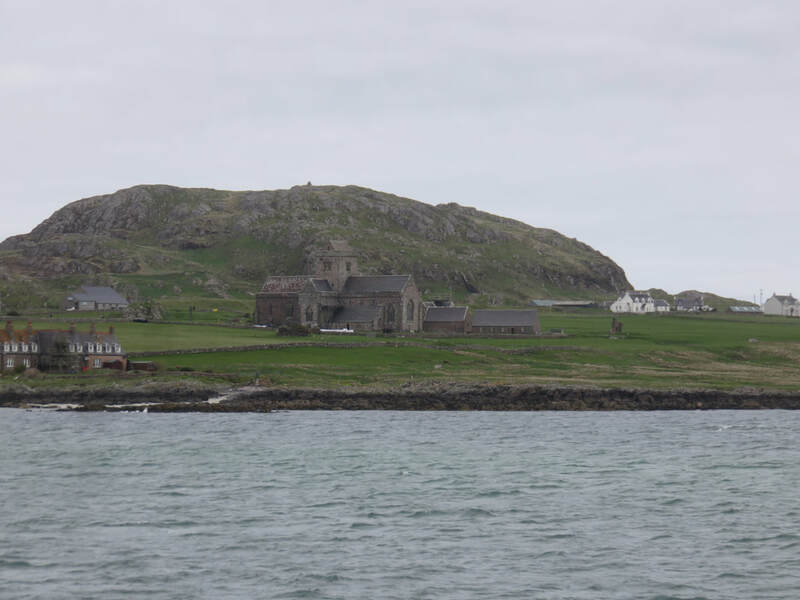 They are a real mix of highs and lows, longs and shorts: on Mull and Iona, Coll and Tiree, Colonsay, and Islay and Jura. Perhaps all next summer? - it would need 2-3 weeks on the basis of this year's ferry timetable, but at least all by car (except Iona)! 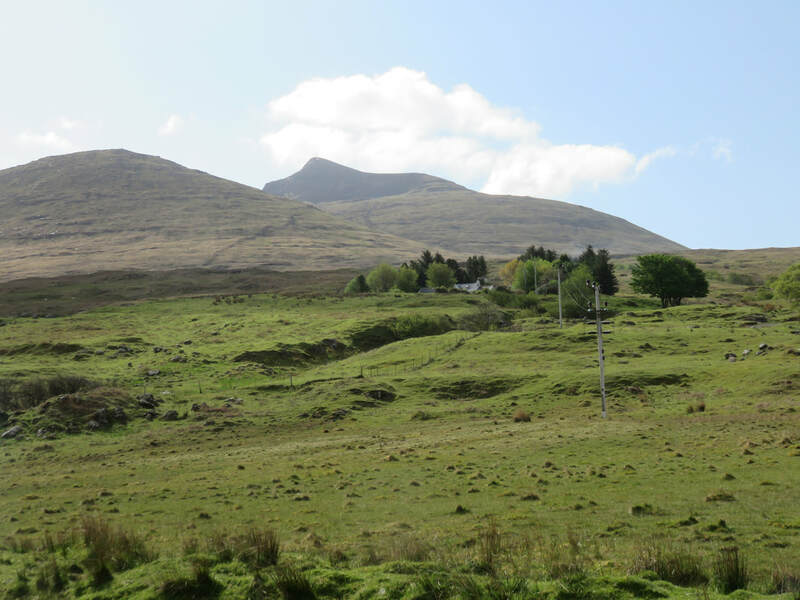 A new book has come out on the High Points of Ireland (the Gribbons!). The compiler is Kieron Gribbon and there is an associated website. The book was published in December last year (2015), with the website (www.highpointireland.com) launched at the same time. The book's title is ​The Gribbons: A Complete List of Ireland's Major Geographical High Points. Climbed Goatfell on ARRAN yesterday (August 10th) - almost a Munro, so it's a Corbett, and it's a Marilyn, and of course a Hardy. I walked in from the ferry then up the main track, which on the final ridge above the col gets surprisingly hard, steepening up through the boulder fields (the path is picked out with small boulder and grit infills - helpful but still "natural"). Seen from the sea below. ​Today a non-core Hardy - GREAT CUMBRAE off Largs, and on Saturday it's BUTE. ​The weather's iffy, but it hasn't spoilt the enjoyment, especially if you like CalMac ferries! 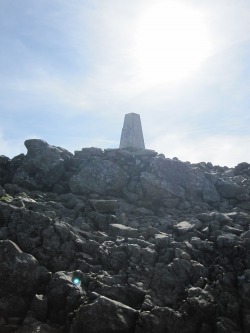 The Ramblers' magazine Walk in its Summer 2016 issue (p15) reports on the OS re-measurement of Ben Nevis, raising its height by a few centimetres - just enough (through rounding protocol) to record this on future OS Maps as 1,345m, no longer 1,344m! I'm sure everybody was wondering what had happened to Mr Blobby? - well, now we know, he's been bagging Hardys! Here he is on Heaval's summit, Barra, Western Isles. It has just been announced that the OS have re-measured Ben Nevis, and have as a result rounded up its official height by 1 metre! - which makes no material difference to anything, except all written references to it anywhere, in print or online, now need to be changed!! All are low-lying islands, two in the Thames Estuary, THORNEY ISLAND near Portsmouth. Finally, the above group of dedicated baggers contribute to the excellent hill baggers site: www.haroldstreet.org.uk , well worth looking up if you haven't done so already. 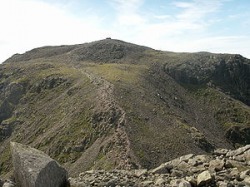 Various changes were made in late June 2013, including updates to reflect the two addditional Hardys and bagging in the Orkneys (the latter resulting in a change of hill!). The Contact page was updated on 14th June 2013, including the addition of a Contact Form. The compiler's profile was updated on 23rd March 2013. The site text was updated during July 2012 to become V2.0/0.1 (some minor residual associated changes are still to be completed). 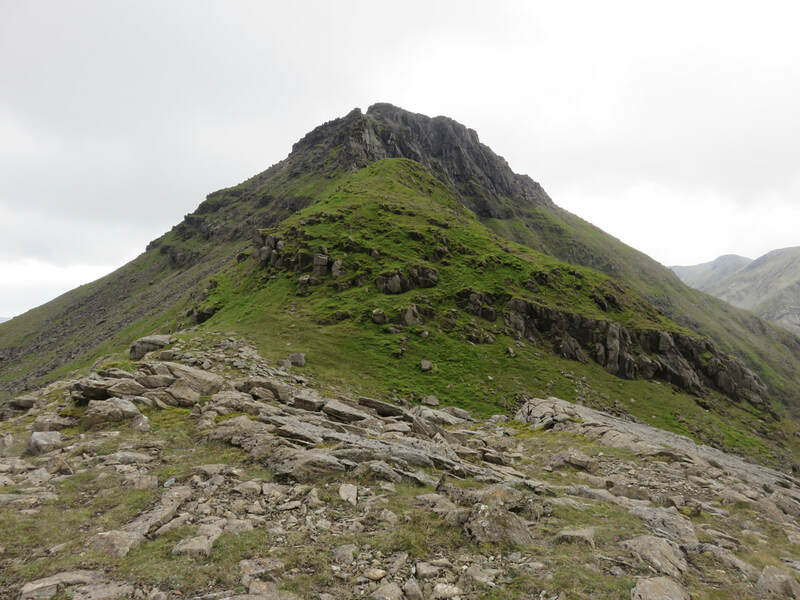 The Hardys is the only source of “high points” covering all the UK’s hill ranges, larger islands and top-tier administrative areas. It provides a comprehensive UK-wide complement to the more “specialised” summit lists (the Munros, Corbetts, Grahams, Hewitts, Marilyns … ), and opens up the fascination and enjoyment of, and achievement in, “bagging” to everybody, whatever their walking abilities and wherever they live in the UK. It is recognised as an authority by the Long Distance Walkers Association (LDWA). There are now 344 Hardys, with the recent identification of PORTSEA ISLAND (essentially the City of Portsmouth!) and FOULNESS ISLAND as island non-core Hardys. The Hardys High Points are listed in a Book, first compiled in the early nineties, and now available in an updated and expanded third edition, including maps and the latest administrative area changes. The book's online version can be found on the Book page, in six PDF parts. An Addenda publishing post-third Edition amendments is also included. The Book provides the criteria for the High Point listings in three categories: hill ranges, islands and top-tier administrative areas. You can bag Hardys just like any other hill list I know there are people out there “doing” The Hardys, and this site can enable me and fellow baggers to keep in touch with how everybody is getting on! Let me know how you are doing (see the Contacts Page) and I will post your info on the site. To encourage participation, I am offering prizes for completing the first “round” of Hardys (verified by me), overall and in several sub-categories (see the Bag Totals page). I also hope you will enjoy looking round the site, and please e-mail me if you have any news, comments, suggestions or queries; or would like any documents e-mailed to you (Word 2003/2010); or to let me know how many Hardys you have already “bagged” (you can count “previous”!) - for the latest "News" go to the News page.